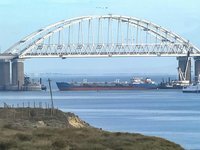 Ukrainian ships currently do not cross the Kerch Strait, and foreign ships pass freely, Ukraine's State Border Service Spokesman Oleh Slobodian has said. "Vessels flying the Ukrainian flag, as a rule, practically do not pass through the Kerch Strait. As for foreign ships, now, under pressure from the international community, the Russian Federation lets them pass more freely, with fewer obstacles, to Ukrainian ports in the Sea of Azov," Slobodian said during a briefing in Kyiv on Thursday.